-Rose Ridge Farms is a registered operation of the of the voluntary VBP program. 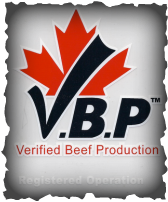 -VBP works by providing a verifiable HACCP based system for internationally recognized food safety standards upheld by Canadian beef producers. -Standard Operating Procedures. These SOPs are designed to reduce or eliminate the possibility of a food safety concern on our beef cattle operation. -Record Keeping. To provide a record of the SOPs practiced, the program includes record keeping requirements that are maintained throughout all key steps of beef production. -Verification. To provide proof of good food safety practices, the program also provides a third party, audit-style process through which our farm operation can achieve the credibility of meeting VBP standards. - Locally grown naturally raised on grass. - NO animal by-products fed. - Livestock is under 24 months of age. - Beef is Dry-Aged 14 days Minimum. - Government-Inspected at a local butcher shop. - Custom cut and wrapped on customer specifications. for an additional charge on smaller orders.